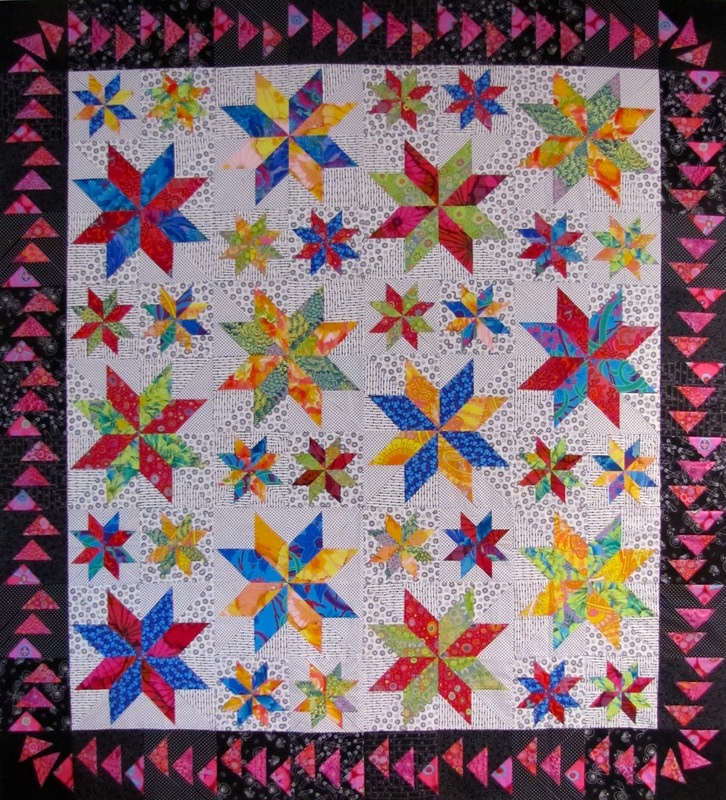 Canton Village Quilt Works | Ahhhh... The Top is Done! Ahhhh... The Top is Done! I am so excited that over the weekend, at the retreat, I was able to complete this quilt top!! My 2 Baby Sisters is done. 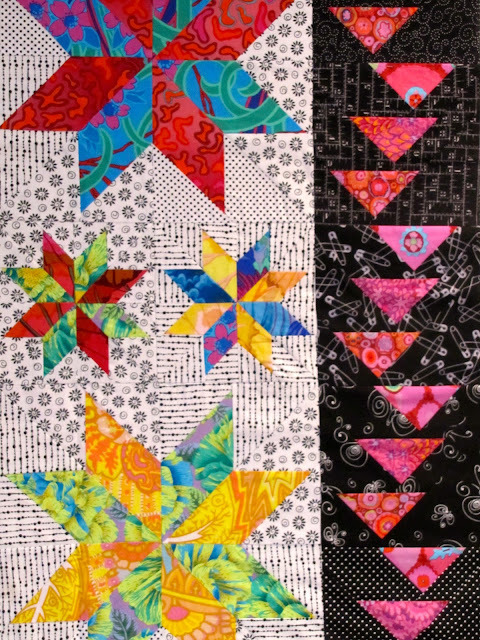 And I am in love... Kaffe Fassett fabrics work so well with black and white and in Judy Niemeyer patterns. But let me let you decide for yourself. 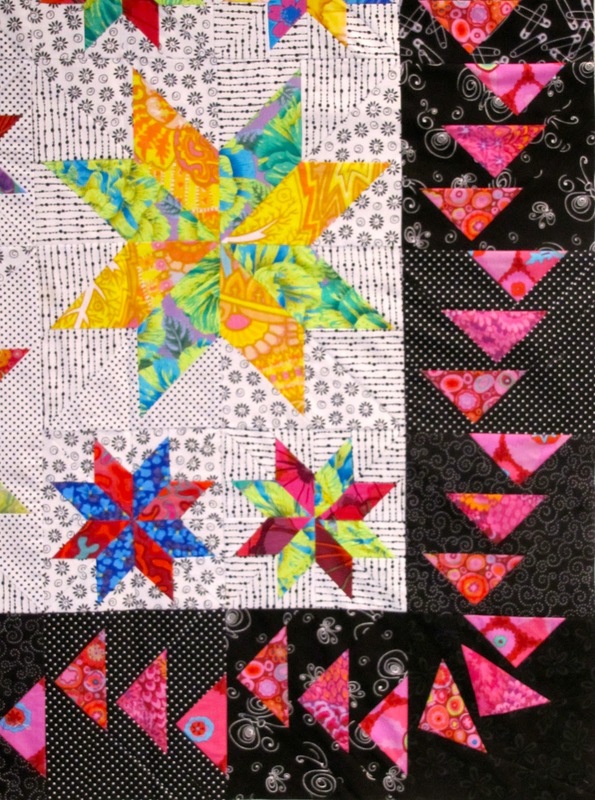 This is a great beginner paper piecing pattern too! No curves. I adore the meandering geese on the borders. The black fabric frames the quilt. Love the corner blocks as they curve around the edge making the geese continuously fly along. Look at where it is too!! Squeal!!! And it is almost done being quilted. Look at my backing fabric... isn't it wild? I love it! This quilt is sooooo me... bright and bold. Now I have to make the binding. Wait until you see what I have in store for that! My 2 Baby Sisters Pattern available here. Kaffe Fassett fabrics available here. Black and white fabrics available here. Take this class with me in Phoenix, AZ at 35 Avenue Sew and Vac. in August. Click here for more information on the class and trunk show and to register. Oh, and I will be kitting it in THIS color way!!! Stay tuned for the final photos!